Even as a child, my interest was captivated by music and spiritual things. A near-death experience at the age of eight not only intensified my visions but also my involvement with invisible phenomena. Around the same time, I discovered my passion for playing the piano. 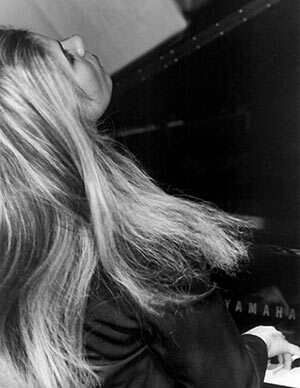 Within a very short time, I knew that I wanted to become a pianist and dedicated every free moment to music. An accident interrupted this time in my life, keeping me bedridden for nearly an entire school year. All day long, all I did was read and listen to music. Once I was healed, I started to have dreams, which later turned out to be true. I was told time and again that I have special intuitive abilities. But my dream was music. So when I was finished with school, I began my studies at the Academy of Music and Theater in Munich, Germany. However, my interest in spiritual books was just as present as before and never lost its hold on me. My piano studies led me to beautiful places such as Rio de Janeiro, London and Long Beach, California. When I returned from Long Beach for a short visit in 2000, I suddenly collapsed. The diagnosis: "Leukemia – an acute health crisis." Back then, it was music that kept me alive. I even rehearsed on a stage piano that my parents and friends had bought for me in my sterile single room at the Großhadern Clinic in Munich. After spending nine months in hospital, I played various concerts, but they always taxed my health. I wasn't fully recovered yet. The years that followed were filled with searching and struggling until I finally decided to strengthen my connection to God and the angels. An acquaintance introduced me to the books of Dr. Doreen Virtue and somehow, I simply knew that I would also be able to communicate with angels. Because I was so weak that I was not able to play piano, I used the time and immersed myself in meditation. At the same time, I also participated in my first EMF Balancing Technique® sessions. After about two months of intensive meditation, I suddenly felt the energy in the room drastically change while I was meditating. I opened my eyes and saw an angel of heavenly beauty, surrounded by emerald green light, and tall enough to reach the ceiling. Tears of gratitude began to stream down my cheeks as he spoke: "I AM archangel Raphael. You can finally see me, you can finally hear me! Now you can be healed." From this moment, archangel Raphael never left my side and gave me exact messages concerning my path to recovery each day. The progress that I made as of that point was absolutely astounding. More and more archangels and other light-filled beings revealed themselves to me and began to communicate with me. It was simply wonder-full. So it wasn't surprising that I felt the desire to support people in difficult situations. I had barely recovered when I began my initial training with Peggy Phoenix Dubro, founder of the EMF Balancing Technique®. A few months later, I opened my practice in Munich where I had clients from the very start, despite the fact that I was completely unknown in this field. Further training in Germany followed until my physical condition eventually improved enough for me to travel to California again, and later, to Hawaii. In this way I was certified as both an ANGEL THERAPY PRACTITIONER® and a medium by Dr. Doreen Virtue. In October 2006, everything finally came full circle. My musical and spiritual work finally came together at Dr. Todd Ovokaitys' "DNA-Seminar" in Salzburg, Austria. After collecting years of experience in my practice, which encompassed a client base from more than 13 countries, and continuing to further my training, I founded ANGEL LIFE COACH® Training in 2009 and developed ISIS ANGEL HEALING® shortly thereafter. In the meantime, I have trained approximately 300 wonderful people from 11 countries to be ANGEL LIFE COACH®es and sent them into the world. An especially meaningful highlight for me was once again the fusion of music and spirituality, in particular, when I had the opportunity to perform several classical pieces and accompany a live channeled meditation with live piano improvisation at the "Fifth International Angel Convention 2010" at the Convention Hall in Salzburg – where I received standing ovations. Since then, I have published four German books ("Die Erzengel," "Die Engel so nah," "Die heilende Kraft deiner Engel"/”The Power of Your Angels” and "Engel und Einhorn – ein himmlisches Team"), over 50 live channeled meditations and two calendars. I also had the chance to appear in various films/DVDs (alongside Gregg Braden, Bruce Lipton, Eric Pearl, Princess Märtha Louise and Elisabeth Nordeng, Lorna Byrne and Pierre Franckh, among others), some of which were even shown in diverse movie theaters both in Germany and abroad, and were nominated for the Cosmic Cine Award. All of my books have already been translated into Italian. England, USA, Australia, New Zealand, South Africa, Spain and France are soon to follow as my 28-day program with angels, "The Healing Power of Your Angels" became a bestseller in both Germany and Italy within just a few weeks or days. The overwhelmingly fast success in Italy took me by surprise because I was unaware of the release date and didn't advertise at all. On the sixth day after publication, it had reached number 1 on the bestseller list of spiritual books, holding its position consistently for weeks and displacing books like "The Secret," etc. I was absolutely speechless! I also had a radio show for two years, called "Angel Messages," featuring guests from all over the world, such as Colette Baron-Reid, Gary Quinn, Princess Märtha Louise and Elisabeth Nordeng, Ingrid Auer and Karina Wagner. I was also interviewed for the many different magazines (ENGELMagazin, NEWsAGE, Awareness Magazine, GLAMOUR Italia, WOMAN, Tina Woman, Focus – to name the most important). Furthermore, I also had the pleasure of having my work filmed by the Bavarian television station, Bayrisches Fernsehen. Today I spend most of my time traveling the world, speaking at international events, giving lectures, workshops and retreats (independently and together with famous personalities like Gary Quinn, Dr. Todd Ovokaitys, Dr. Roy Martina, Michelle Karén, and others) and provide my ANGEL LIFE COACH® Training to continue bringing the wonderful energies of angels and other beings of light into the world. It is my great desire to open people's hearts to more light, love and peace with both my spiritual work and my music, and to show them that ANYTHING is possible if we simply learn to completely trust and live true to my motto, "Love is always the answer, whatever the question is."